CNS Canada — Many farmers taking off their first hay cuts are also gathering more talking points to grumble over at coffee row. 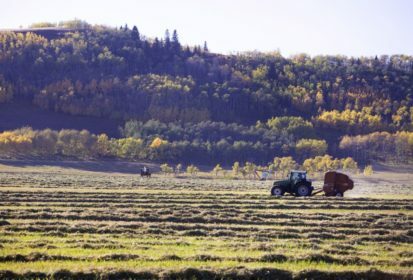 “In areas of the province where moisture was lacking through that important time of May and they also had some above-average temperatures, in those areas certainly hay yields have been affected,” said Mark Cutts, a crop specialist with Alberta Agriculture and Forestry at Lacombe. He estimated half to two-thirds of the hay in the driest areas could see lower-than-average yields. Central and southern Alberta are especially dry and northeastern and northwestern regions are also reporting below-average yields. The Peace region appears to be the outlier this year, with average hay yields reported. Cutts cautioned it’s too soon to give up on the crop. “It will be interesting to see how it plays out. Showers have been happening in different areas of the province now, so some areas are getting moisture, which will help for the second cut. As the summer progresses, producers will begin making decisions based on their field conditions, he said. Manitoba’s Interlake is especially dry, he said, with most areas receiving well below average moisture. Southern fields are also withering under dry conditions, he said, adding that good hay crops are being reported in the Winkler-Morden and Riding Mountain-Dauphin areas. Fox said he has already heard talk of producers in drier areas sourcing supplemental feed supplies to ensure they will have enough to feed their herds. One producer near Winnipegosis has two-thirds of his supply stacked up in his yard already, he said. First-cut hay in Saskatchewan is also showing below-average yields in southeastern, east-central and west-central regions, while low topsoil moisture and heat are dragging down all production in the southwest. Hay crops in the northeast have received good moisture and 20 per cent of the first cut is rated excellent, with 80 per cent rated good. In the northwest, most areas have adequate moisture with an average crop, but strong winds and rain are hindering harvest, according to the latest provincial crop report.